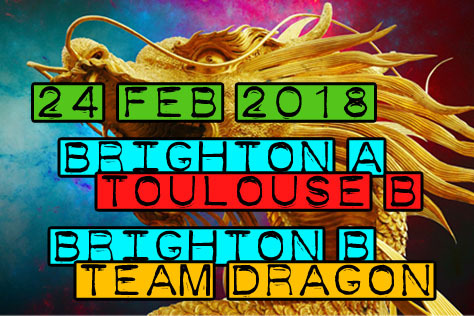 Some You WIN, Some TOULOUSE | BRIGHTON ROCKERS Take On THE FRENCH And SOME DRAGONS | Roller Derby THIS SATURDAY Yay! 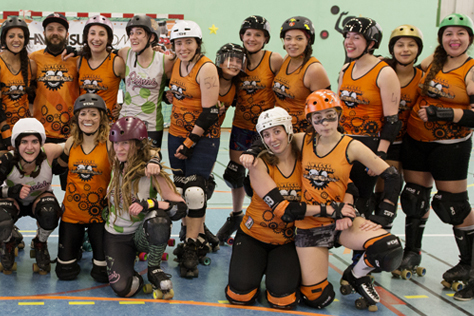 …er, except their opponents are the Blocka Nostra B-team of Roller Derby Toulouse. Team France had an awesome World Cup, eventually finishing sixth out of the 38 teams. And how many of the French squad were from the Toulouse A-team? More than half of them (11/20) including five out of the six jammers! (Indeed, the only jammer not from Toulouse was Caen’s Dédé Froquée who Brighton have previously been on the wrong end of.) 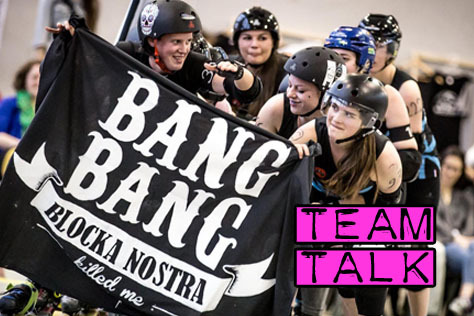 OK, so the Rockers aren’t facing those Toulouse A-team international skaters on Saturday, but they will be facing an entire B-team coached and trained by them! 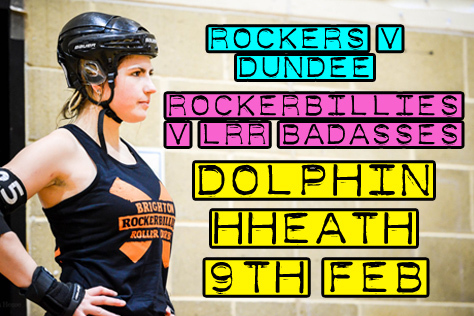 As for the day’s other game, Brighton’s B-team Rockerbillies take on the Team Dragon challenge side. These two teams met here in September 2016. Whilst the ‘billies won 200-118 that day, half of the Brighton squad then were ringers from Eastbourne’s Bourne Bombshells. Both sides will be hugely changed for this encounter. Team Dragon utilise a huge roster of skaters from various leagues. 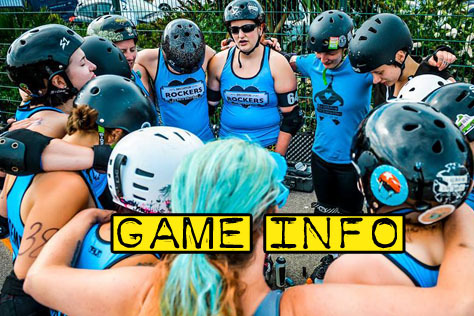 Their biggest links are with the London Rollergirls network however, and alongside feisty LRG Rec Leaguers, it’s not surprising to see the odd ‘retired’ superstar pop up in their ranks… so this one really isn’t for the guessing! Events are taking place (as ever) at the Dolphin in Haywards Heath, one of the UK’s top venues for open door roller derby. 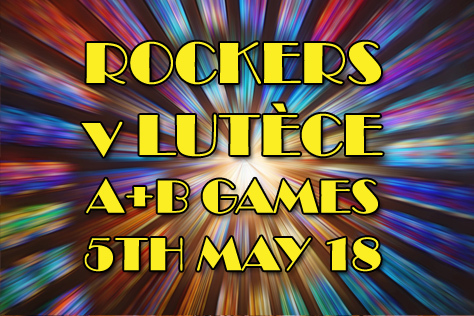 The Rockers have reduced ticket prices to £8 in advance (£9.50 on the door) for adults, with a reduced price for students and free tickets for under 12s. Haywards Heath is around 15 mins from Brighton on the choo-choo, and the venue is then seven minutes walk; turn left outside the train station and follow the signs. Doors are at 2pm, but if you arrive early there’s a decent enough pub (the Burrell Arms) opposite the station and a huge Sainsbury’s (with ATMs if you need cash) halfway between the station and venue. The after party will be back in Brighton at the Earth & Stars pub. This looks like being one of the biggest crowds to a Rockers game in a while, so don’t delay if you haven’t yet snapped up tickets. We’re also promised merch stalls, a cake stand, a guess the sweets in the jar game, derby bingo cards, colouring competitions for the kids, and an opportunity to throw live chickens at the skaters (we might have misunderstood and/or imagined that last one). Don’t forget to pick up your free copy of our magazine Turn Left on the door – this one’s a World Cup Special, with various Rockers folks’ thoughts on attending this month’s event in Manchester. ***SPOILER ALERT – SKIP THIS PARAGRAPH IF YOU DON’T LIKE READING PREDICTIONS BEFORE GAMES*** Whilst Flattrackstats include some Team Dragon results in their database, they don’t offer rankings for challenge teams, hence no prediction either. So you’ll just have to guess what will happen in the B-team game. As for the main event, the Rockers AllStars currently place 57th in Europe on 611.2 points, with Toulouse’s Blocka Nostra 70th on 597.1. Even with home advantage, the Rockers are only given 66% chance of victory. The expected differential of 36:29 works out as something like a 180-145 home win, which is super close in derby terms – so this one could go either way! 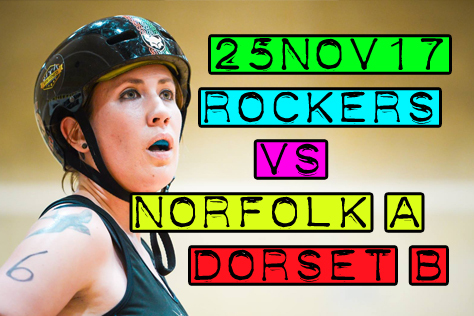 Shut The DORSET, Don’t Let NORFOLK In – The BRIGHTON ROCKERS Host Epic Roller Derby THIS SATURDAY Yay! 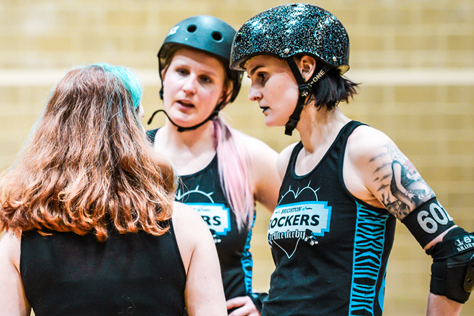 And for extra spice, the Rockers A-team beat Cambridge away 162-145 in a game they were expected to draw or lose on Saturday just gone, so will be super fired-up for Brighton’s first time ever playing public games on two Saturdays in a row! Meanwhile, five players will make their debut for Brighton B against a Dorset side who are playing their first ever open door away match… Wowsers! How can so much awesomes possibly be contained in a single event? 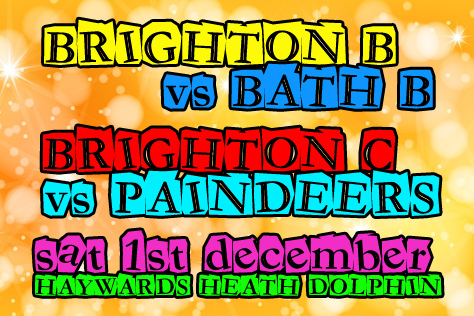 Saturday’s action takes places at the Dolphin Leisure Centre in Haywards Heath. Doors are at 2pm, with the B-team game around 2.30 and the A-teams at 4.55. Tickets (£10 adults, £8 students, free for under 12s) are available from the link at the bottom of this preview and most likely on the door too. Car types should point their SatNav at RH16 1LY. For train folks the venue is seven minutes walk from Haywards Heath (turn left and follow the signs stuck to lampposts etc). There’s no engineering work on the trains for once, yay! The pub opposite the station (the Burrell Arms) isn’t sure if it’s a sports bar or a food pub, but it’s OK for a pint and a few dozen Jägers and has a huge garden. There’s a big Sainsbury’s halfway between the station and venue, which is useful for specialist snacks and ATMs (no ATM at the leisure centre). The venue has a booze table in the hall, a café in the lobby, and many vending machines. The after party is back in Brighton in the Western, slap bang in the centre of town; five mins walk from the station, the beach, etc. Don’t forget to pick up your free copy of our tawdry Rockers fanzine TURN LEFT on the door. In this issue Cake Or Death predicts today’s A-team score, we talk to the five B-team debutants, get the inside line from the visiting teams, and much more. 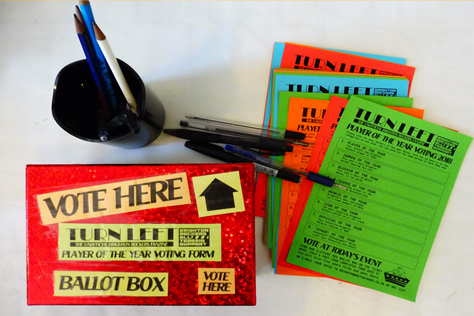 As it’s the last game of the year it also includes a voting form for our Annual Awards. And if you want to be eligible for such an award yourself next year, please note that Brighton have their 2018 Fresh Meat taster sessions on Monday (27th Nov) and Sunday (3rd Dec) so drop a message to info@brightonrockers.com asap. You know you want to. [NB Skip this section if you don’t like to hear predictions ahead of games.] As far as the A-team Rockers v Brawds game goes, the UKRDA and European rankings on Flattrackstats offer widely differing predictions. The Rockers place 25th in UKRDA on 595.0 points with Norfolk 36th on 549.5. Throw in home advantage and FTS gives Brighton 83% chance of the win here, with a predicted differential of 17:10 working out as something like a 221-130 comfortable home win. It’s worth bearing in mind that UKRDA rankings are only updated every three months, and Brighton (in particular) tend to play against more European than UKRDA sides these days, so you’re probably not getting that up-to-date or accurate a picture with this prediction.